I used to be an avid reader of John Grisham novels but for some reason they started to lose their attraction. I think they started to get a bit samey which is why I didn’t read any for a couple of years. However, I was recently reminded me that this book was still in my ‘to read’ pile so I thought that I would give it a go. 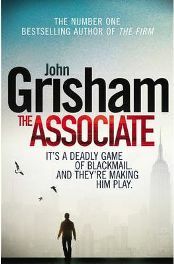 I did enjoy reading ‘The Associate’ although I don’t think that it really has the same edge and suspense as some of Grisham’s earlier books. ‘The Associate’ features a young law graduate called Kyle McAvoy. We meet him when he is just about to finish law school and is considering his future. He thinks he might start his career by doing some legal aid work but unfortunately for him, he comes across some nasty men who have other ideas! These men also have possession of a video that could incriminate Kyle in an alleged assault that took place during his college days during a drunken party. The men are prepared to bury the tape but only if Kyle is prepared to do what they ask which is to go and work as an associate as a prestigious New York law firm and basically act as their mole. Kyle doesn’t feel that he has a choice so this is what he ends up doing and that is what the story is about. Can Kyle manage to do what they ask without being disbarred, retaining his self respect and by not falling victim to these violent men? Grisham keeps the reader guessing to the very last page! ‘The Associate’ is a fast turning novel with a good deal of suspense and anticipation. As the reader I found it virtually impossible to work out how it was all going to end up and there were plenty of surprises and a few twists along the way. There were times though when the pace did slow quite a bit though and at these times I did find my interest waning a bit. This was mainly when the story described some of the legal aspects and the work of the associates which I sometimes found difficult to follow. It did make up for it at other times though. I did feel for Kyle in his predicament but I didn’t feel that I got to know him that well as a character. I think that if you do know and like a character, it makes it all much more suspenseful when that character is in trouble as you really care about what will happen. I didn’t feel like that about Kyle but that didn’t necessarily mean that I did not enjoy reading about him. Overall, ‘The Associate’ is a good novel with all of the right ingredients to keep the reader engaged. I am glad that I read it although I have to admit that, unfortunately, it has not reignited my love of Grisham novels. No Comments on "The Associate"